Do you know what is really frightening? Each one of you here this morning is contagious . . . not the contagious that speaks of you infecting someone else with your H1N1 flu or cold or cough or rash or flesh eating virus. No, but the impact your current walk with God has upon others. If you’re in the Spirit, you will influence others totally differently than if you are in the flesh. Never ever forget, your words and attitudes are contagious – they influence people for God’s glory or for the world, the flesh, and the devil. Have you ever said, “When momma ain’t happy, ain’t nobody happy”? That’s the power of influence… for bad! Today on the patio, what you talk about will influence others, adding to the glory of God or taking away from the glory of God! The question is not whether or not you are contagious – the only question is what disease you are actually passing on to others. Everyone of you is contagious, and the big question is this . . . what are you passing on, what disease are they catching from you, what kind of influence are you having on others? Each one of us is influencing others around us 24/7. We influence people in what they talk about, which is why the Bible is so high on always giving thanks and so condemning of gossips, critics, cynics, and complainers. We influence people in how they feel, which is why the Bible is so strong towards us rejoicing and so down on whiners and sullenness. And we influence people by what we hope in. Do those around you see you hoping in Christ, trusting in His Word, anticipating heaven and rejoicing in God’s salvation given to you? Or do they only see you speaking about sports, school, kids, trials, and current events like all non-Christians talk about? How contagious for Christ are you? As Peter wraps up his first long sentence in chapter 1, he is impacting his readers with the example of three different groups. The believers reading first Peter had been kicked out of Rome and sent to the frontier of the empire because of their faith in Christ. They have to start over in a hostile place surrounded by suspicious people in a region open to attack from enemies. So Peter really zaps them right at the beginning! They are feeling bad that they have been called by God to suffer in this foreign place, so Peter tells them, “Don’t forget, you have been called by God as aliens on this foreign planet! You may be immersed in a region with the potential for death, but you have already been eternally born again, made alive by God. You may struggle in this life, but heaven is guaranteed. You may not be rescued from suffering or persecution, but your eternal final salvation rescue is awesome! And it is this salvation that God wants us to focus on. So Peter wraps up the long sentence of verses 3-12 by sharing about three groups of people who were contagious with salvation. They wanted to know all about it, learn about it, think about it, wonder about it and tell everyone about it. God’s plan is to infect you with the same contagious disease. To get you wondering, excited, thankful, living by, meditating on our salvation, the cross, the gospel . . . 24/7 . . . just like these 3 groups. Are you excited about your salvation? Are you studying the Word about salvation? Are you reminding yourself every day about the gospel? Are you allowing the gospel to impact everyday life? If you’re discouraged, or falling into routine, then allow God’s Word to re-orient your affections and re-discover your joy because of the greatness of the salvation you have in Christ–and for a few of you, the salvation you can have if you turn to Christ in repentance and faith. Here are three passionate pursuits of salvation by three different groups. Three models of salvation enthusiasm for us to be infected by . . . When you look at the OT prophets, they are absolutely enthralled with God’s salvation. And as we picked through verse 10 to the beginning of verse 12, we found that the salvation they pursued was old, graced, researched, bloody, future and delayed. Read verse 10, “As to this salvation, the prophets who prophesied of the grace that would come to you made careful search and inquiry, 11 seeking to know what person or time the Spirit of Christ within them was indicating as He predicted the sufferings of Christ and the glories to follow. 12 It was revealed to them that they were not serving themselves, but you.” But as Peter continues to write, he moves from the Old Testament to the New Testament and describes yet another group we did not look at last week who were totally fired up about salvation, and that is . . .
Verse 12 “It was revealed to them that they were not serving themselves, but you, in these things which now have been announced to you through those who preached the gospel to you by the Holy Spirit sent from heaven.” Those who preached the gospel to you are the apostles. 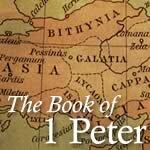 Peter was the first apostle to preach the gospel in Acts 2 with the New Testament sermon about the gospel, telling us that . . .
First, It is shared news In these things which now have been announced to you, the word “announced” and words like it are translated message, to tell, to report, declare, to proclaim, to publish abroad and to herald. Simply, this is a message that you share, a truth you explain, a report you clearly, fully and joyously pass on. The same word “announce” is used in Acts 20:20, “How I did not shrink from declaring to you anything that was profitable, and teaching you publicly and from house to house,” and in verse 27 this way, “For I did not shrink from declaring to you the whole purpose of God.” Paul didn’t just state it, he explained it fully and clearly. The gospel is to be explained completely! This is what the apostles did in Acts . . . they shared the gospel. You could not stop them in 4:20, “For we cannot stop speaking what we have seen and heard.” You could not stop Paul in 9:28, “And he was with them moving about freely in Jerusalem, speaking out boldly in the name of the Lord.” God encouraged the apostle Paul not to stop speaking in 18:9, “And the Lord said to Paul in the night by a vision, ‘Do not be afraid any longer, but go on speaking and do not be silent. '” This is a message that must be declared, it must be explained. Our salvation must be shared. For a long time, Jean’s parents both lived in Southern California, while we lived in the Northwest. Both of us were burdened about her divorced, now remarried parents not knowing Christ. So we flew down just to invest extended time with them that we might be able to explain, declare and announce the message of salvation; it meant a lot to us and to them. We are still hopeful, but are also thankful we took the time to be clear, to make sure it was understood, and that they sensed His love and our love. Our salvation is to be a shared message. Remember, you are contagious – if people you love never hear you say anything about what you consider most important, they will conclude that it is not very important to you or to them. It is only as they see your humble desire to share this message with them, that they will understand just how important it is. We are to tell people about salvation – verse 12, the apostles announced it. Not just live differently, not merely go to church, or talk about church, but actually tell people about salvation in Christ . . . it is shared news. Second, It is good news Verse 12 “In these things which now have been announced to you through those who preached the gospel to you by the Holy Spirit sent from heaven.” The apostles were those who preached the gospel. They came announcing that salvation is gospel. They came declaring that salvation is good news. They preached the gospel – we use the term so much, we forget what it means –great news, the best news, the only news. That is why grace is so important – expecting the judgment from God, grace is good news. There is someone who can take our punishment, who died in our stead on a cross; who experienced alienation from God, so we don’t have to; who bore up under God’s wrath, so we don’t experience His anger; who suffered hell for us, so we don’t have to go there; that is good news; unbelievably good news. And this good news has been proclaimed to you. I couldn’t wait to share with Jean when I was ordained. I couldn’t wait to tell my friends when I was asked to preach. I couldn’t wait to tell my friends about you, my church family. But that is nothing compared to telling others about how they can be reconciled with Christ. My beloved family, are you passionate about telling others about how to be right with Christ? The apostles were passionate about this message because it’s good news; the only news about how to be one with Christ and go to heaven. You should be taking the same message with the same passion and give it to the people of your generation with the same heart. What has happened to you? The apostles declared in Acts 4:12, “And there is salvation in no one else; for there is no other name under heaven that has been given among men, by which we must be saved.” Do you know what happened when they taught this? They were arrested and were sternly threatened. What was their response to arrest and threats? Acts 4:20, “For we cannot stop speaking what we have seen and heard.” They were threatened. The readers of 1 Peter were suffering, later they were killed, but they would not stop sharing the gospel. Wow! What a far cry from typical Christians today. These apostles didn’t say, “Do you go to church somewhere?” Nor, “God loves you and has a wonderful plan for your life.” But the apostles shared good news – God did the work to make us right with God by punishing His own Son in your place. Sadly, not only are we bad at sharing the good news, we are also not good at sharing the bad news. No one will see the good news clearly until they recognize the bad news of your sin, your violation of God’s law. Friend, Jesus is returning to the earth, He has a sword in His hand and He is angry. But, there is a way for you to become one. People need to understand they are in serious soup. You were, and some of you still are, in serious danger. You must turn to Christ in repentance and faith. You must exchange all that you are, for all that He is. It is good news because you can have salvation today if you would turn to Christ! Not only is it shared news and good news, also . .
Third, It is divine news Verse 12, “In these things which now have been announced to you through those who preached the gospel to you by the Holy Spirit sent from heaven.” The apostles didn’t make this up any more than the prophets did. This is not a human story, this is not a religious tale, this is not one belief among many beliefs in the world, this is divine news. This is a message from God, this is the message from God, that you are saved from God, by God and for God, by grace alone, through faith alone, in Christ alone. Get this, in verse 12, “they preached the gospel to you by the Holy Spirit sent from heaven.” The law of antecedent here says the Holy Spirit here is the same Holy Spirit in the previous verse, verse 11. This is a divine message, given to prophets, then apostles. The Gospel was not made up by the musings of men. No person would invent this story. What is it? You are in trouble with God because of your sin, so God came to earth to take care of the sin trouble you are having with Him. He paid the price you should have paid, and did it all for you from start to finish. If man had invented this story, man would be the hero. Humans would have something to contribute. People would somehow be able to earn their own salvation. This good news is not a story invented by men, it’s divine! The Holy Spirit sent from heaven spoke to the apostles and proclaimed through them the truth of the gospel in the New Testament, built upon the foundation of the prophets in the Old Testament, teaching us salvation is from God, by God and for God. Notice verse 12 tells us the Holy Spirit was sent from God. “Sent” is the same word used for apostle, sent one. The Holy Spirit was sent (apostled) specifically to the apostles, so they’d proclaim and record the gospel to the entire world of people. This message is divine, and it comes with divine resources. On the heels of the great commission, Jesus says in Matthew 28:18, “All authority has been given to Me in heaven and on earth.” Prior to Christ’s ascension, He commissions His own in Acts 1:8, “You shall receive power when the Holy Spirit has come upon you; and you shall be My witnesses both in Jerusalem, and in all Judea and Samaria, and even to the remotest part of the earth.” God’s message of salvation is powered by the Holy Spirit, and it was sent by the Holy Spirit to be announced by the apostles. And as they announced it, it came with power so people were saved. There is salvation available to you friend, you don’t have to live and die in your sins. That is great news! I was about to be unjustly fired, I was under judgment, and in a moment, with one small comment, the assistant manager removed the sword from over my head – the judgment and anger ended. The axe was about to fall – then I was rescued. When we fully embrace that God’s judgment should fall on us for our sin; that we fully deserve God’s punishment, God’s anger and eternal hell forever, only then do we really appreciate what God did for us in punishing His Son in our place. Only then does the preciousness of what Jesus did on the cross totally overwhelm us. You are contagious, Christian–are you infecting anyone with the good news from heaven that was given to us by prophets and apostles? Finally, Peter concludes with something shocking–what is it? He says there is another race of beings totally interested in salvation. First, Angels see a lot in salvation “Things” plural–angels look into salvation and see lots of things going on. Did you notice the plural word “things”? It’s not just one thing. They are blown away that sinful man can be made right with God. They are amazed with all that is involved in salvation. Are you amazed too? Do you take time to know what is involved with your salvation? Do you read good theologies as they describe the amazing things God has done in saving you? Good theology books today – get one or more. Do you have a great soteriology? . . . that’s the doctrine of salvation. Angels do–they know about . . .
Angels have a great soteriology. They have done their homework when it comes to meditation over salvation, the cross, the atonement and all its deep nuances! How many salvation truths do you know and reflect on weekly? In Revelation, a lot of angels have multiple eyes to catch better views of God and multiple wings to shift their view of God. They are always trying to see something new, always catching a deeper glimpse into an attribute of the awesome God. There is so much to see in an infinite God, and I believe angels pursue knowing Him with a passion. We should too. I am certain angels are asking questions like . . . how could that be? . . . wow, isn’t that something? . . . look at this quality–in God, Christ and the Spirit . . . wow! This is so amazing, because the Savior died for them, they could inherit and actually be co-heirs with Christ. Wow! Possibly, there might be questions too, like . . . Lord, do you know how difficult it is for us to do your will with these humans, living how they live and doing what they do? And I am just talking about those people at Faith Bible Church! Angels see things in salvation; what do you see? Or right now, is your heart more prone to say, I am saved and going to heaven, so now what’s for lunch? Or are you in deep wonder about your salvation, overwhelmed with thanks and deeply moved in praise! Do you see things like the angels see in salvation? And notice next . . .
Second, Angels can’t see enough of salvation At the end of verse 12, Peter says, “into which angels long to look.” Holy angels are a race of spirit beings who serve God and do His bidding. Fallen angels or demons, are those angels who chose to sin with Satan and now do his bidding, and all angels wonder with awe concerning salvation. The word “long” gives you a picture of angels standing on their tippy toes, with wings hovering, as high as they can get, or as close as they dare, in order to intensely look into the plan of salvation. 2 Peter 2:4 tells us angels are unredeemable – once they chose to sin, there was no possibility of salvation for them. Verse 4, “For if God did not spare angels when they sinned, but cast them into hell and committed them to pits of darkness, reserved for judgment.” When angels sinned they were sealed in that fate forever. There’s no Savior for them. They had one chance, once done, its over. Angels can’t die, and if they can’t die, then no one can die in their place – the way Christ, the God-man, died in our place. So with angels being unredeemable, they wonder about redemption. “Why would You redeem these Christians, Lord, when their entire lives have been made up of choices to rebel against Your Word, do their own thing, sin freely against Your will and sin freely by not doing Your will? Why forgive them; why give them grace?” They long to understand this. But they can’t fully–they are so amazed by salvation they wish every second of their existence to understand what you can understand, if you have received Christ in repentance and faith. Again, you and I have the advantage. If you know Christ as your Redeemer, you enjoy a special relationship with Him now and forever. You’re in a better position than the angels because of what Christ did for you in salvation. That is a great place to be. We’re amazed by angels, but they are even more amazed about you. When Peter says “long to look” in verse 12, it’s literally they ache; they stretch out to look, they take a longer long look; they want to know more and more. Are you as curious as they are? Or has your curiosity been swallowed up by familiarity? Their familiarity in heaven only results in a greater passion to know more and it breeds more curiosity. Sometimes our familiarity causes us to be bored and stop searching, learning and growing. Do you look into the things of salvation? Angels are saying to you, “Can you believe you are forgiven? Can you believe what God did for you, can you believe God’s grace and mercy and kindness and His love? Wow – can you believe it?” God sent His Son to die for His own–for you! The bottom line for angels is this–it doesn’t make sense, and they have sinless minds. They have lived for 6,000 plus years. But they’re still overwhelmed by salvation and hungry to know more. Holy angels are contagious in their desire to know more about salvation – are you? Do you know the Lord today? Are you amazed by grace? Angels wish they understood what you have in Christ. Friends . . .
ONE Those most daily overwhelmed by the gospel are more prone to share the gospel regularly. When you remember how sinful you were, and when you are in tune with just how sinful you still are, you will be more overwhelmed by God’s grace to you. Then when you live with a thankful heart, a heart that knows every day that no matter what is happening to you, even unfair stuff, that you are getting better than you deserve – you’ll be more prone to share the gospel with others. You will desperately want others to be delivered from sin and know Christ. TWO Those that live moment by moment by faith will experience more joy in this life. Verses 3-12 contain a strong push to live by faith, not by sight. Faith is living dependently – it is living each moment knowing we can’t do it. Faith is recognizing every moment, that unless Christ lives through us, nothing we do will bring glory to God or bring satisfaction to our lives. Some of you right now are empty and joyless, and it is because you are either unsaved or not dependent! It is only those who live every moment dependent upon the Spirit of God according to the Word of God who know God’s joy. Only the dependent see joy in suffering, rejoice during trials, have joy in the normal groanings of life. And only those who live by faith are wonderfully contagious. THREE Those who are the most contagious are those who live in daily wonder about Christ and His Gospel. Do you want to impact your children for Christ? Then start wondering out loud often about how great God is. I was at the beach with Jean watching the birds running up and down with the surf and marveling at God’s creative mind. Can you picture the vast mind necessary to create just birds, let alone every species on this planet – amazing, awesome. Every day, we should have the same wonder about our salvation –start every day with, “I am chosen!” Then ask again, “Why me?” You want to impact others, then wonder about your salvation. Their small house was simple but adequate. It consisted of one large room on a dusty street. Its red-tiled roof was one of many in this poor neighborhood on the outskirts of the Brazilian village. It was a comfortable home. Maria and her daughter, Christina, had done what they could to add color to the gray walls and warmth to the hard dirt floor: an old calendar, a faded photograph of a relative, a wooden crucifix. The furnishings were modest: a pallet on either side of the room, a washbasin, and a wood-burning stove. Maria’s husband had died when Christina was an infant. The young mother, stubbornly refusing opportunities to remarry, got a job and set out to raise her young daughter, and now 15 years later the worst years were over. Though Maria’s salary as a maid afforded few luxuries, it was reliable and it did provide food and clothes. Now Christina was old enough to get a job to help out. Some said Christina got her independence from her mother. She recoiled at the traditional idea of marrying young and raising a family. Not that she couldn’t have had her pick of a husband. Her olive skin and brown eyes kept a steady stream of prospects at the door. She had an infectious way of throwing her head back and filling the room with laughter. She also had that rare magic some women have that makes every man feel like a king just by being near them. But it was her spirited curiosity that made her keep all the men at arm’s length. Maria knew exactly what Christina would do, or would have to do for a living. That’s why her heart broke when she awoke one morning to find her daughter’s bed empty. Maria knew where her daughter had gone. She also knew immediately what she must do to find her. She quickly threw some clothes in a bag, gathered up all her money, and ran out of the house. On her way to the bus stop, she entered a drugstore to get one last thing. Pictures. She sat in the photograph booth, closed the curtain, and spent all she could on pictures of herself. With her purse full of small black-and-white photos, she boarded the next bus to Rio de Janeiro. Maria knew Christina had no way of earning money. She also knew her daughter was too stubborn to give up. When pride meets hunger, a human will do things that were before unthinkable. Knowing this, Maria began her search. Bars, hotels, nightclubs, any place with the reputation for street walkers or prostitutes. She went to them all. And at each place she left her picture taped on a bathroom mirror, tacked to a hotel bulletin board, fastened to a corner phone booth. And on the back of each photo she wrote a note. It wasn’t too long before both the money and the pictures ran out, and Maria had to go home. The weary mother wept as the bus began its long journey back to her small village. It was a few weeks later that young Christina descended the hotel stairs. Her young face was tired. Her brown eyes no longer danced with youth but spoke of pain and fear. Her laughter was broken. Her dream had become a nightmare. A thousand times over she had longed to trade these countless beds for her secure pallet. Yet the little village was, in too many ways, too far away. As she reached the bottom of the stairs, her eyes noticed a familiar face. She looked again, and there on the lobby mirror was a small picture of her mother. Christina’s eyes burned and her throat tightened as she walked across the room and removed the small photo. Written on the back was this compelling invitation. “Whatever you have done, whatever you have become, it doesn’t matter. Please come home.” She did.